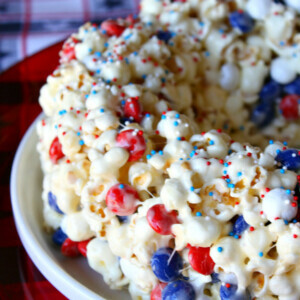 This easy bundt cake recipe is made from popcorn, melted marshmallows and chocolate candies. In a large pot, melt the butter. Add the marshmallows and stir to melt. When the mixture is smooth, add the popcorn and stir to coat. Let it cool down a bit (or transfer to a large bowl to speed up the cooling process), then stir in the candy pieces. You don't want to add the candy pieces when the mixture is too hot because you don't want to melt the chocolate! Spray a bundt pan with nonstick spray. Transfer the popcorn mixture to the bundt pan and press evenly into the pan. Let sit for a few minutes, then pop the cake out onto a platter, and pat some sprinkles into the top of the cake. Let it sit until it's a bit more firm before cutting and serving. Cover leftovers with plastic wrap and enjoy over the next couple of days.